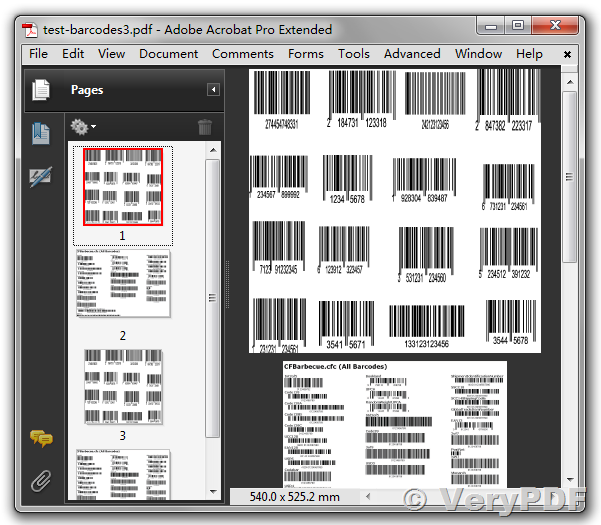 As you know, VeryPDF .NET Barcode Reader Library can be used to scan and recognize 1D and 2D barcodes from common image file formats (like PNG, JPEG, TIFF, GIF, BMP). However, there are also a lot of needs for decoding barcode information from PDF file in Visual C#.NET project. So, we provide a solution for this. To achieve fast C# barcode recognition from PDF document, both our .NET Barcode Reader SDK and .NET PDF to Image Conversion SDK should be used. For more information, you can see VeryPDF PDF to Image Converter in .NET. These two SDKs support reading 10+ barcode types from PDF file using C# programming language, like linear barcodes (Code128, UPC-A, UPC-E, EAN8, EAN13, etc.) and matrix barcodes (QRCode, PDF417, DataMatrix, etc.). Now, taking linear bar code as an example, we will introduce you how to detect and decode Code 128 barcode image from PDF document page in C#.NET application. First, launch Visual Studio and create a new Console Application. Then, download "VeryPDF .NET PDF to Image SDK" and ".NET Barcode Reader SDK", and add "VeryPDF.PDFtoImageCom" and "VeryPDF.BarcodeCom" to your C# project reference. Finally, copy and paste the following free C# code into your project. This entry was posted in Barcode Generator and tagged barcode api, barcode image, barcode pdf, barcode reader, barcode recognition, barcode sdk, read barcode. Bookmark the permalink.